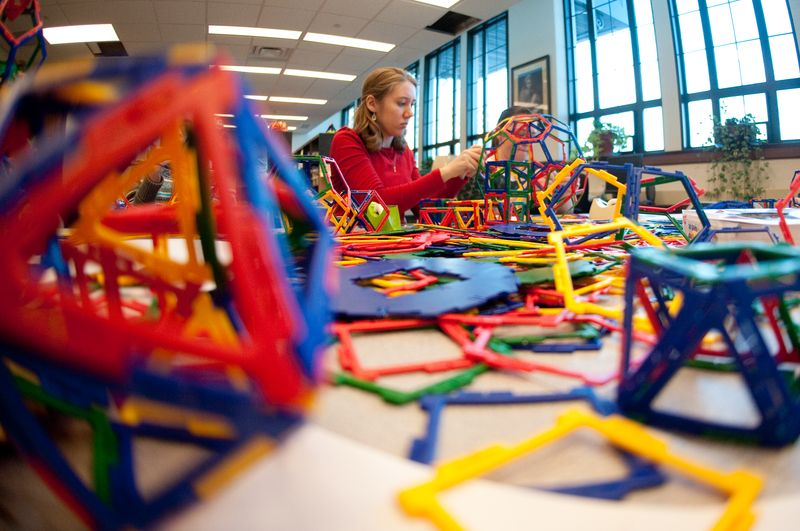 Giggles and octagons could seem incompatible, but inside the Indiana State University math library they fit together naturally. One middle school girl talks of a boy asking her out, another speaks about a student teacher in her class. All the while, their hands fashion 3-D geometrical figures called semi-regular polyhedra out of plastic squares, rectangles and various polygons such as pentagons, hexagons and octagons. 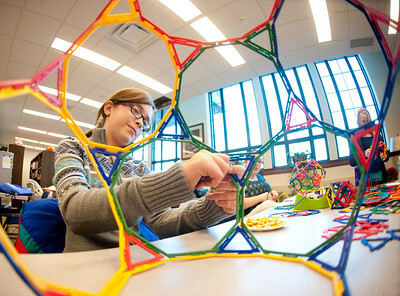 "This is fun," said Martha Bell, a seventh grade student at Sarah Scott Middle School in Terre Haute. "I could do this all day." The laughter and math come together with Indiana State's program M2 for Girls or Mathematics and Mentoring for Girls. With an object of creating a sense of excitement pride in girls about being math savvy, it seems to be working. Girls from Honey Creek, Sarah Scott, Otter Creek and Chauncey Rose middle schools in Terre Haute attend the twice a month program led by Liz Brown, ISU associate professor of mathematics and computer science. Female university students, who are studying to be math teachers, mentor the middle school students. A $5,000 grant from the Mathematics Association of America pays stipends to the college students and buys materials for the program. Brown hopes to find additional funding to continue the program next year. 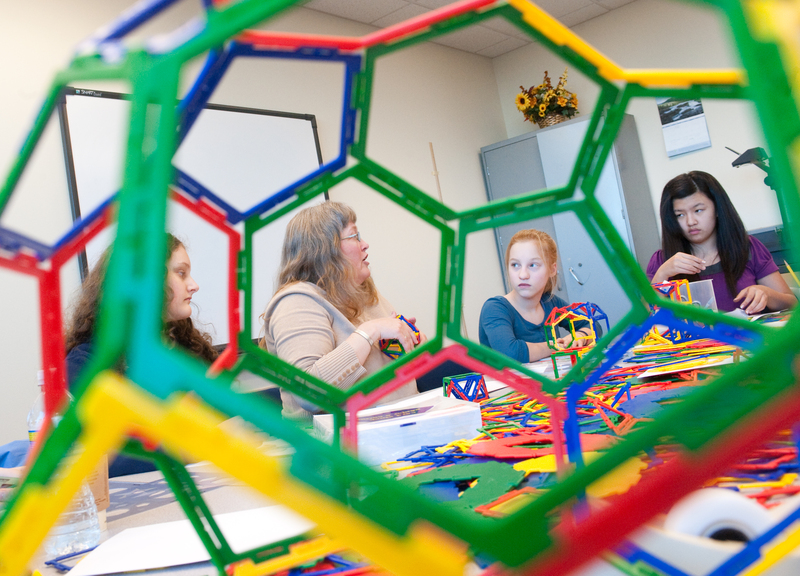 "This is to bring together girls from different areas that all show an interest in math and like it," Brown said. Studies have shown that girls' interest in mathematics wanes in junior high and worsens in high school. In college, Brown said, girls tend to pick majors based on the amount of math classes they have to take. "I'm not trying to turn them into mathematicians. If some do, then great," Brown said. "It's more to keep them interested in math." "For all the thought that kids don't like math, we have a group of girls who say, ‘Yeah, this is fun,'" said Jessica Hamm, a senior math education major from Terre Haute. During a recent Thursday afternoon inside the University Hall room, Brown led the fluid discussion from school classes and boys to shapes and what they become if sliced apart. She uses math that the junior high girls often wouldn't see until high school. "I try to extend the math, go deeper and further," she said. Jessica Markle, an ISU sophomore math and math education major from Linton, Ind., said she didn't have much interest in math during junior high. "I got more interested in math in high school because it's more application," she said. "It's a lot more interesting when you get to apply basic knowledge to things of more than one dimension. That's what we're doing here and what they will be doing in high school." Liz Jenkins, a seventh grade student at Otter Creek Middle School who called math her favorite subject, said she enjoys learning more about math. "You don't have to sit there and read a bunch of stuff," she said. "You get to think." For Anthea Weng, seventh grade student at Honey Creek, the rewards of math come from solving problems. "I just feel better when I've figured it out because then I've figured something out," she said. While the university students help the middle school students with the different projects, they learn as well. "They have a tendency to understand a lot more than I give them credit for or other people give them credit for," Hamm said. "We try to impart that it's not a bad thing to do math. It can be fun." Bringing together girls from various middle schools within the county, also builds friendships between them. "It builds a community for the girls," Brown said. Markle said at first the middle school girls only spoke with the other girls from their school. "Now they're more unified," she said. "They get to meet and make new and different type of friends." Jenkins would go further than that. "They're just fun to hang out with," she said. "They're like my sisters." Program seeks to promote pride in girls for being math savvy.